I’m not actually crazy, but sometimes, I do crazy things. And I usually do them when I travel. From accidentally getting a hold of a hotel’s master key to exploring abandoned buildings (with common sense, of course), befriending metal bands, and ignoring the need for sleep while travelling 30+ hours straight, I had loads of beyond memorable adventures while living in Europe. As a budget traveler, I’ve also done some crazy things to keep my trip costs as low as possible. And making some rather wild decisions when visiting Norway last fall was no exception. 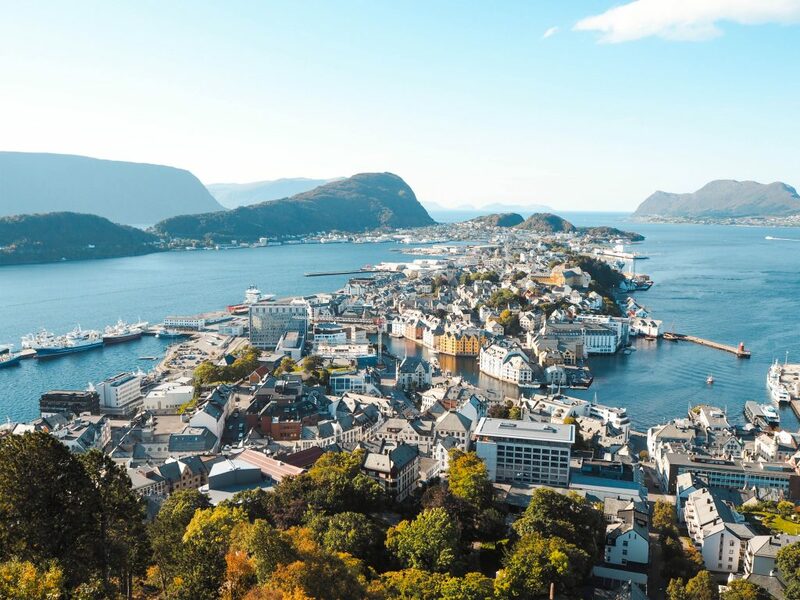 It’s a fact: Norway, like the rest of Scandinavia, is an expensive country to visit. 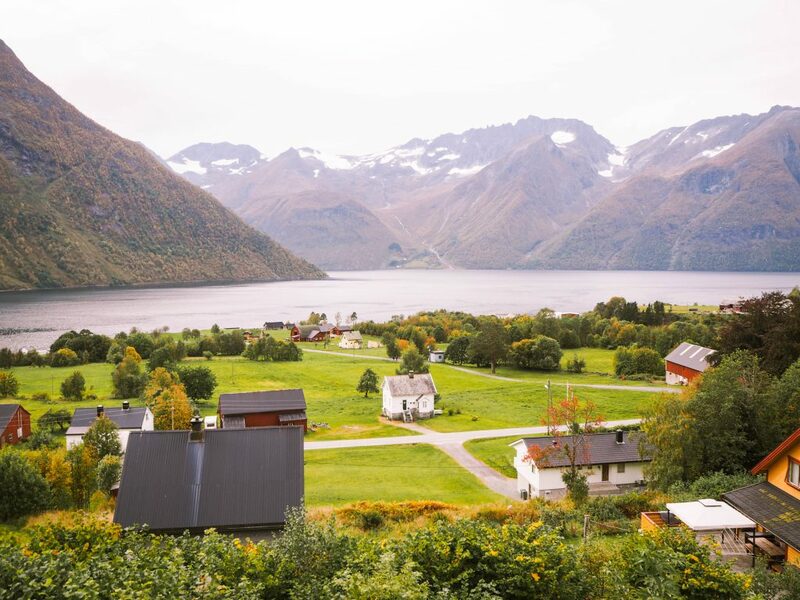 But with some careful planning and packing, it’s possible to experience Norway for less. As an added bonus, I’ve included my Norway budget breakdown at the end! When traveling around Norway, I opted to take trains when crossing long distances instead of planes. (The only exceptions were a 2-hour bus ride and a 24-hour cruise). I even took trains in and out of Norway, but I’ll admit I was in a rather advantageous position to start with since I was living in Sweden at the time. Bergen’s Skuteviken district. 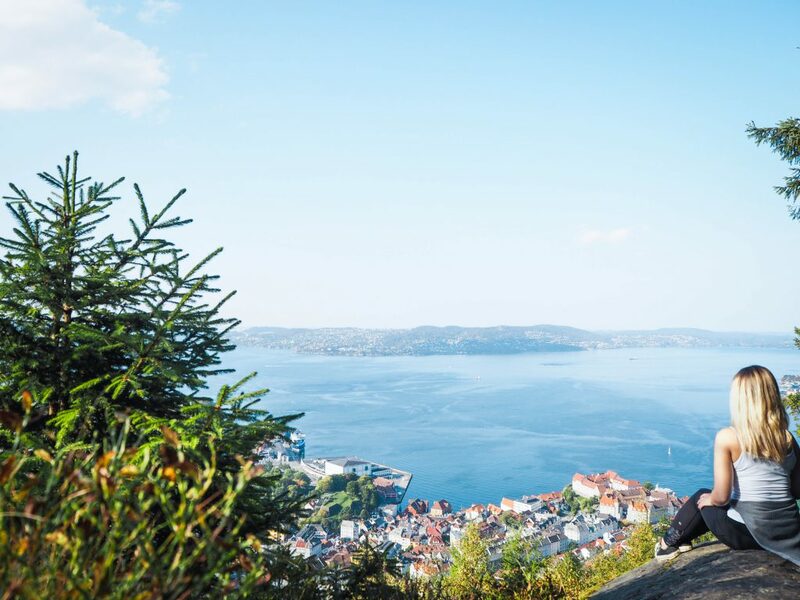 I took an overnight train into Bergen and spent the following day exploring the city on less than 4 hours of solid sleep. It was totally worth it! 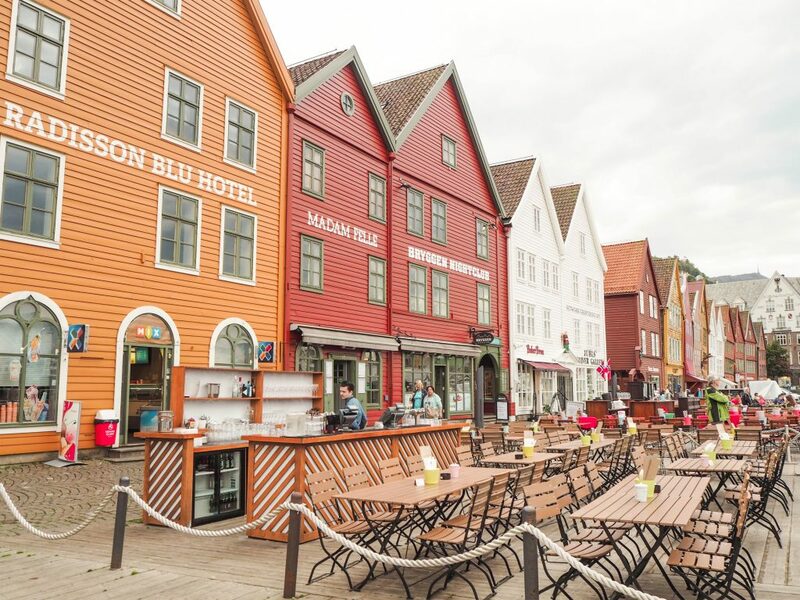 Bryggen, Bergen – the city’s famous UNESCO World Heritage Site in the heart of the city centre. NSB is Norway’s national train company, and you can purchase all your train tickets on the NSB website. NSB releases train tickets for a specific day 90 days in advance, and train fares tend to be at their lowest as soon as they’re released. They go up in price over time. If you act fast, you can also get your hands on reduced fare “Minipris” tickets, which cost significantly less than standard fare tickets. (The main difference between “Minipris” and “Standard Fare” tickets is that the discounted ones are non-refundable). In order to get the most affordable train fares, I stayed up until midnight more days than I could count. And when I realized that the first ticket I had planned on buying had already gone up in price 5 minutes after being released (I was traveling at the end of high season), I shifted the rest of my travel plans so I could leave the following day. To cut back on the cost of my trip to Norway further, I traveled to different destinations overnight so I could use transportation as accommodation. 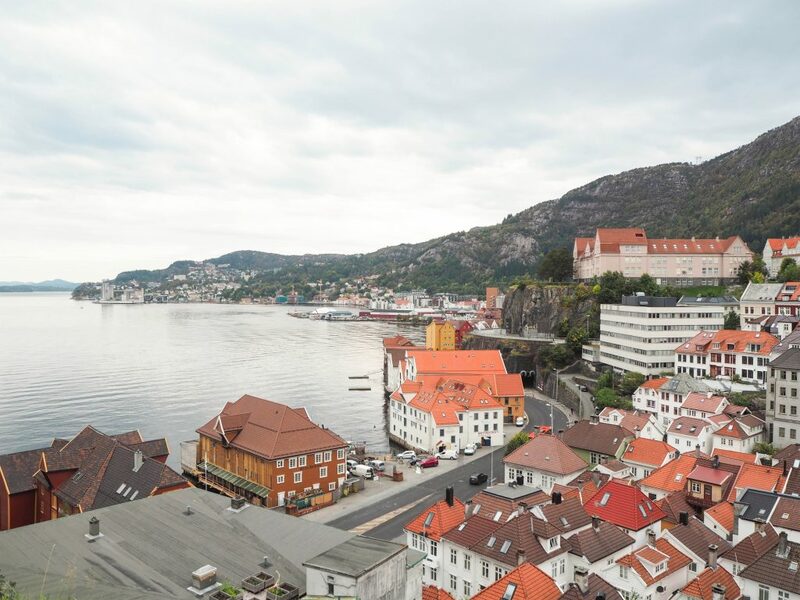 I took a night train from Oslo to Bergen and an overnight cruise from Bergen to Ålesund. When taking the night train, I also saved by not booking a bed in a sleeper cabin and slept in a regular seat. (I had booked a sleeper cabin when traveling from Vienna, Austria to Warsaw, Poland a year earlier, and I really found it too cramped). For the nights I wasn’t traveling, I only booked rooms in hostel dorms. Other than camping and couchsurfing, hostel dorms tend to be a cheap form of accommodation in Norway. I made my reservations through Booking.com immediately after buying my train tickets so I could get the lowest prices. Extra Tip: I always also make sure to book rooms that offer free cancellations until 2-3 days before my stay in case anything changes. 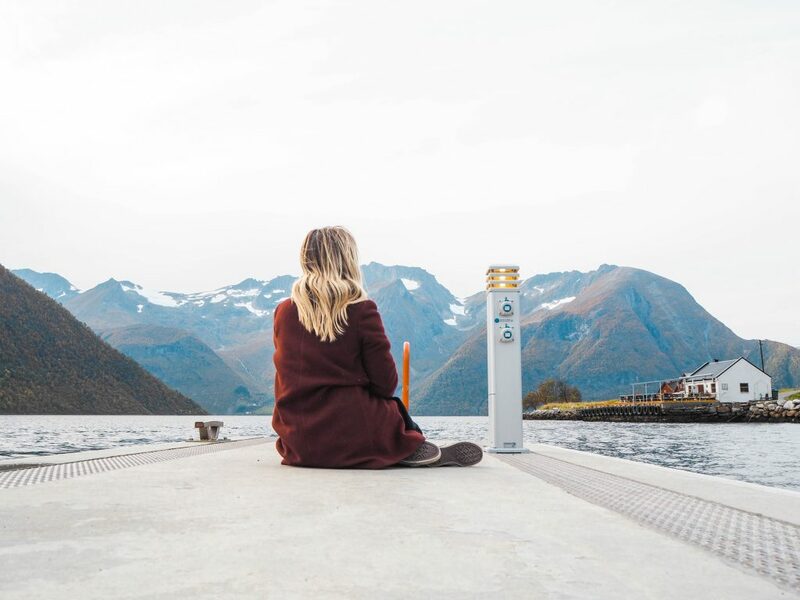 Norway in a Nutshell, operated by fjordtours, is one of the country’s most popular and iconic tours. 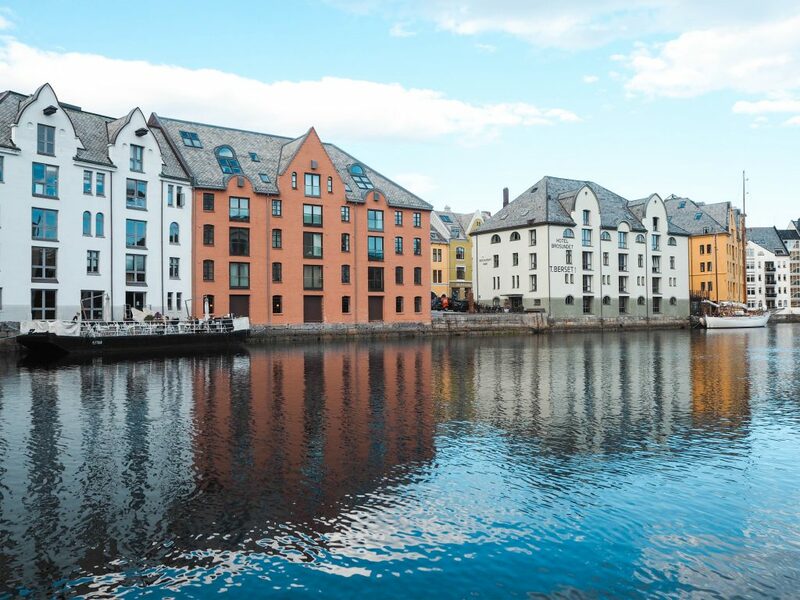 The trip itinerary is flexible and includes stops in Bergen, Oslo, Flam, and Voss with a boat ride along the Aurlandsfjord and Nærøyfjord. Sounds great, right? The starting price for the tour is 1,600 NOK, and if you don’t book in advance, the price can easily go over 2,000 NOK. Instead, independently booking my tickets to Oslo, Bergen, and Ålesund (which included a 24-hour cruise and a trip to the gorgeous Hjørundfjord) added up to 1,425 NOK. Fjord views from Urke, Norway. 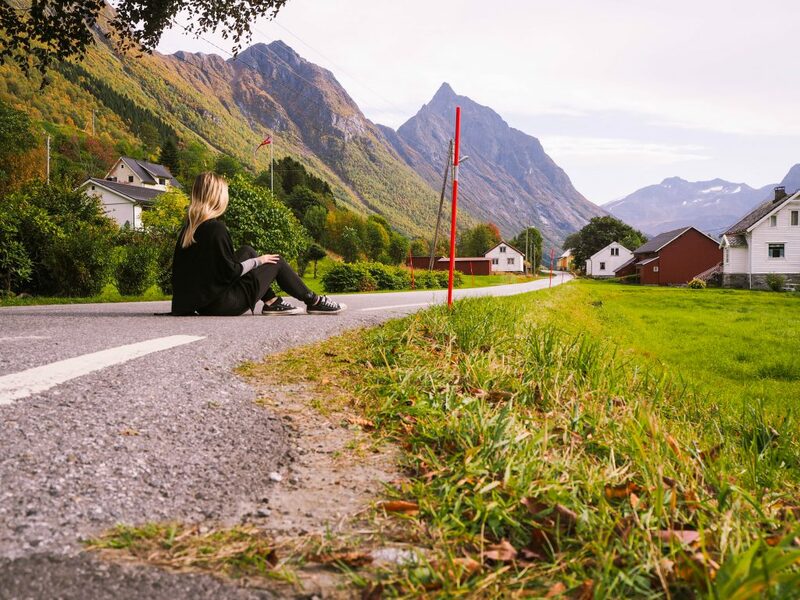 Simply head over heels with Urke, Norway. Hurtigruten is one of Norway’s main cruise and ferry companies. If you’re hoping to travel up or down Norway’s west coast by boat, I can’t recommend Hurtigruten enough. If you’d like to get lower fares with the cruise company, book in Norwegian on Hurtigruten’s Norwegian website. 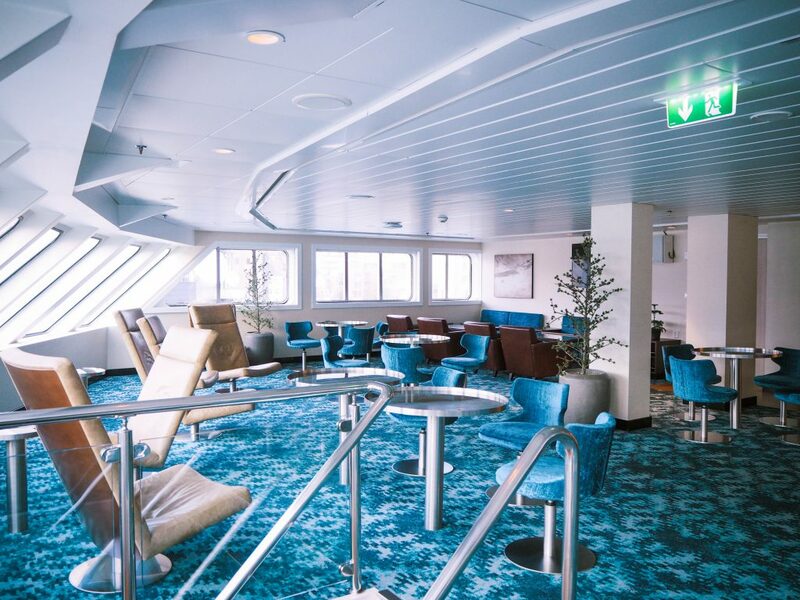 For more detailed tips about going on a Hurtigruten cruise for less, check out my blog post about booking a Hurtigruten cruise and seeing the fjords on a budget. Beyond stunning Urke, Norway is a stop on Hurtigruten’s September and October cruise itineraries. You don’t have to book a full 1 to 2 week cruise in order to travel aboard a Hurtigruten ship. In addition to offering traditional cruises, Hurtigruten ships also provide ferry services for individuals travelling port to port along the Norwegian Coast. Since the journey from Bergen to Ålesund only included 1 night, I saved by not having to book a cabin. Instead, I just dozed off on a comfy couch in one of the ship’s many lounges. Though I took trains, buses, and ships between different cities, I never took public transportation within a city. Not even once. I walked all around Ålesund, Bergen, and Oslo’s downtown core. I hiked up and down Mt. Fløyen in Bergen and strolled through every corner of Urke, Norway. My step count was through the roof and so were my savings. I also don’t actually know how many times I climbed up and down the 400+ steps leading to Ålesund’s Aksla Viewpoint. 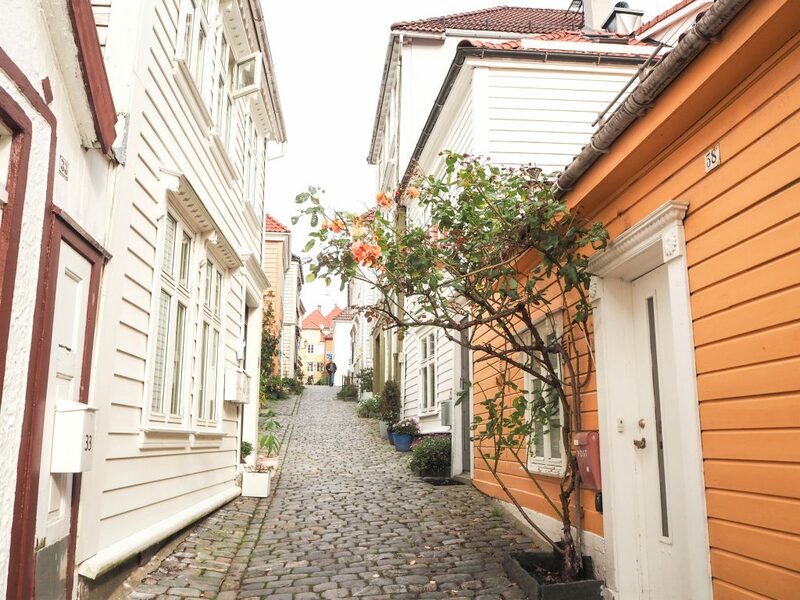 Exploring Bergen, Norway’s picture-perfect side streets. Hiking up Mt. Fløyen to catch a panoramic view of Bergen. Eating and drinking out in Norway can get pretty expensive. It’s common for dinner dish from a simple restaurant to cost over $18 USD. If you plan on dining out for breakfast, lunch, and dinner, your daily budget will be quite high. To keep my food and drink costs as low as possible, I bought almost all of my food from grocery stores and used hostel kitchens to prepare warm meals. Unlike Swedish grocery stores, Norwegian grocery stores sell instant oatmeal, which is what I basically lived off of for breakfast every day. If you don’t have the chance to cook every meal, Norway is full of 7-Elevens that sell pizza slices for around 15 NOK/ $2 USD. Extra Tip: Pack tupperware with you so you can enjoy what you’ve cooked on the go. I did! *I used SJ PRIO points I had accumulated from taking trains in Sweden on my way back to Falun (aka my Swedish hometown). Part of Ålesund’s gorgeous Art Nouveau District. 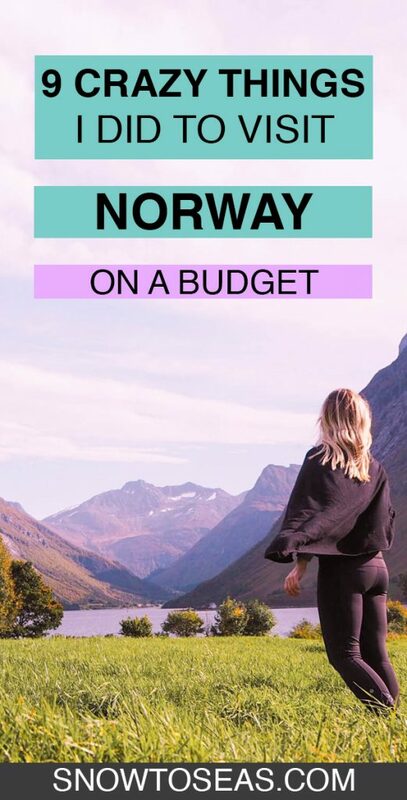 I’ll admit that I knew I hadn’t spent a crazy amount in Norway, but I didn’t do an exact breakdown until I was writing this post. Honestly, I was surprised to find out that a week in Norway could cost less than $515 USD. While it may seem like it’s easiest and cheapest to take a train from a neighbouring country to Norway, it’s totally possible to find budget flights under $30 USD from other cities in Europe (check out wizzair.com). Last but not least, I want to give credit where credit is due, so here’s a shout out to my friend, Eva, at Electric Blue Food. She introduced me to tips 2, 3, and 6, and I simply put them into action! Find out how you can go on a 24 Hurtigruten Fjord Cruise for Less! Discover what you should see and do when hiking Mt. Fløyen in Bergen, Norway! Have you been to Norway? Would you like to go? Share your thoughts and experiences in the comments section below!